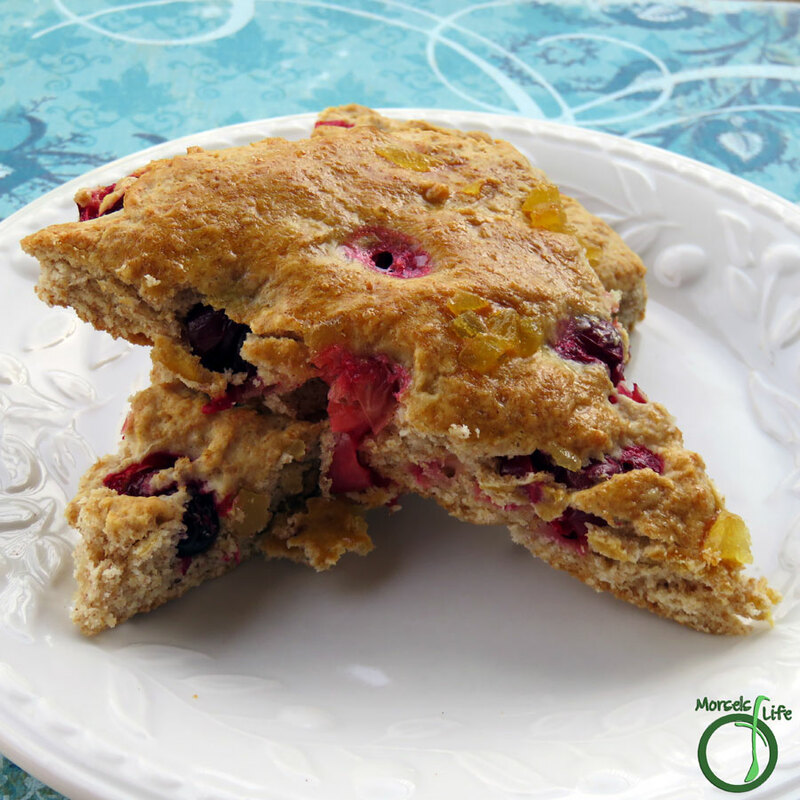 Sweetly tart cranberries paired with sweetly spicy candied ginger in a scrumptious scone. Lately, my refrigerator's a collection of half-done recipes, ingredients, and incomplete ideas. As busy as work has become, I had allowed the small, 80s relic of an ice chest to become quickly crowded. Among its many residents was a bag of cranberries, reminding me of this recipe on Strawberry Roan. Also, around that time, I had to whip up another batch of on-the-go breakfasts, and then I knew exactly what to do! Making scones was something I hadn't done before, but I was eager to try, and they turned out much better than I had hoped for a first time try. It's a heavier pastry than I'm used to, but the tart cranberry seemed to make it feel lighter. (It's a scone after all, and those tend to be heavier than your typical breads or muffins.) I enjoyed these with a fragrant cup of jasmine green tea in the mornings, but James thought them best enjoyed with a nauseatingly strong cup of coffee. I also added some candied ginger on a few of them. The sweetly tart cranberries and sweetly spicy ginger paired quite well! What are some of your favorite scone flavor pairings? 2/3 cup milk I used whole, but cream or half and half would work too. 2/3 cup cranberries, fresh, frozen, or dried I used frozen. Cut the butter into flour until only small bits remain. Roll out dough to about an inch thick and cut into 8 pieces. Sprinkle some candied ginger on top if desired. Bake at 425F for 15 minutes, until lightly golden brown.